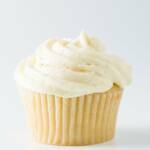 This is the best vanilla cupcake you will ever have! Use a vanilla bean for the best vanilla flavor. Use cake flour for a lighter crumb. Be careful not to over-mix the batter. Use room temperature ingredients - everything will mix together more smoothly that way. Because everyone's oven is just a bit different and your liners may be a slightly different size than mine, I highly recommend that you bake a test cupcake before baking your whole batch of vanilla cupcakes. Read my FAQ on filling cupcake liners to learn how to do a test cupcake and why it's useful.